“You can use any social media channel for B2B,” said Erica Ayotte, social media marketing manager at Constant Contact. She should know. Her team has grown their Pinterest following to over 18,000 in less than two years. How does a company that is not retail and not inherently visual use Pinterest to reach a B2B target audience? The keys are to expand your idea of what your brand is, think visually and have a curating mindset. Here’s how Constant Contact appeals to their small-business market on Pinterest. 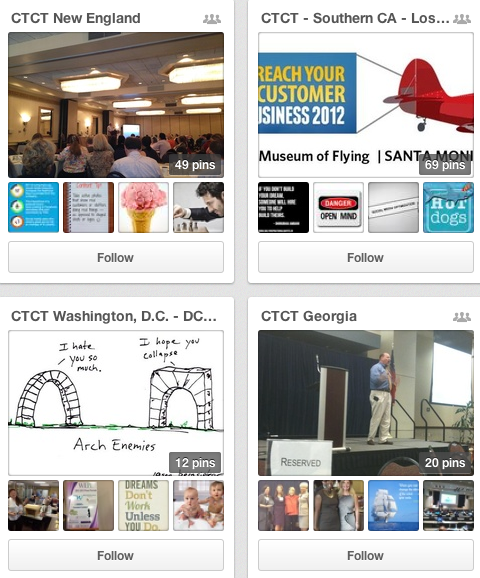 Constant Contact has 92 Pinterest boards with over 4,000 pins. Ayotte urges B2B companies to take a wider view of what their business is really about when thinking about Pinterest. Constant Contact is a software company serving mostly small- and medium-sized businesses and nonprofits. Over half of their customers have fewer than five employees, and 70 percent of them have fewer than 10 employees. In taking in a wider perspective of what they do, Ayotte said that they are really about helping small businesses achieve their goals. “At the end of the day, it’s not about software,” she said. Taking this expanded view helped her team identify other things their customers would be interested in that could be pinned. 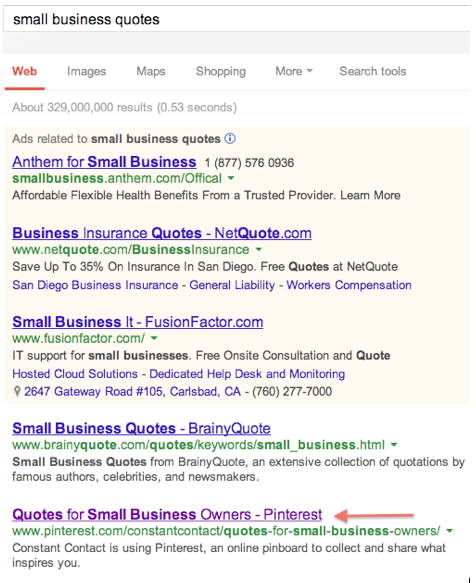 Constant Contact's quotes board ranks second in Google search. Marketing humor is another popular board. Since most of their customers are small businesses for whom marketing resources are stretched thin, it’s not surprising that quotes, tips and humor do well. 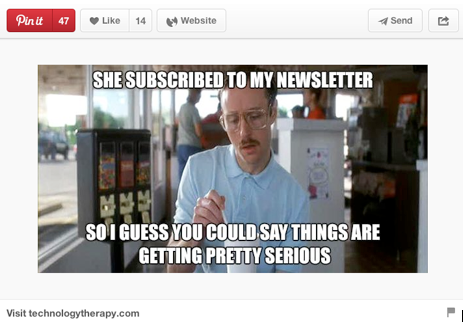 Marketing humor is popular with Constant Contact's followers. Pinterest is more suited to evergreen content than Facebook or Twitter. Ayotte suggests that businesses starting out begin with a few boards with evergreen topics and slowly add content as they get a feel for what their audience is interested in. If you’re getting repins, it’s resonating with the audience. If not, try something else. Once you’ve identified topics your audience is interested in, how do you make them visually appealing? If you’re a B2B company, particularly in service or software, you may think that your business does not have visual content to use on Pinterest. “You really have to be very creative,” said Ayotte. Constant Contact is a master at creating visually appealing content from quotes, tips and statistics. Corporate community manager Danielle Cormier will often use PicMonkey to create word images for quotes, statistics, etc., and link the image to the source. The quote below came from the Brian Tracy Quote of the Day newsletter that Constant Contact made into a visually appealing pin. 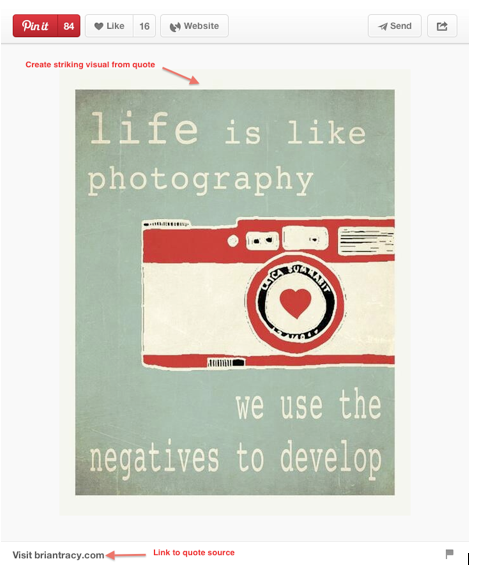 Creating illustrated quotes is one way to create visual content for pinning. You can even pin inherently non-visual content such as press releases by pulling out a key statistic and using a stock image to create a striking visual. 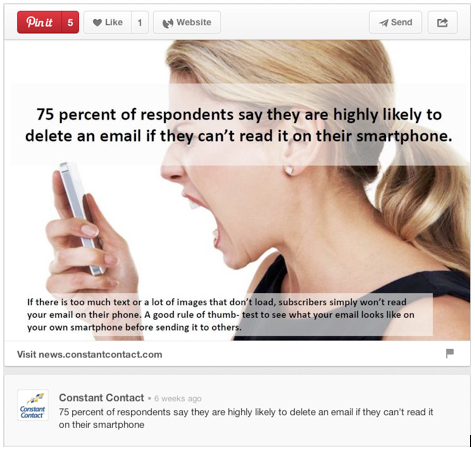 Constant Contact created this visual to link to a press release on their blog. Another technique is to create and/or link to infographics, but split them up into multiple pins. This increases readability and helps populate your boards, which also helps with SEO. 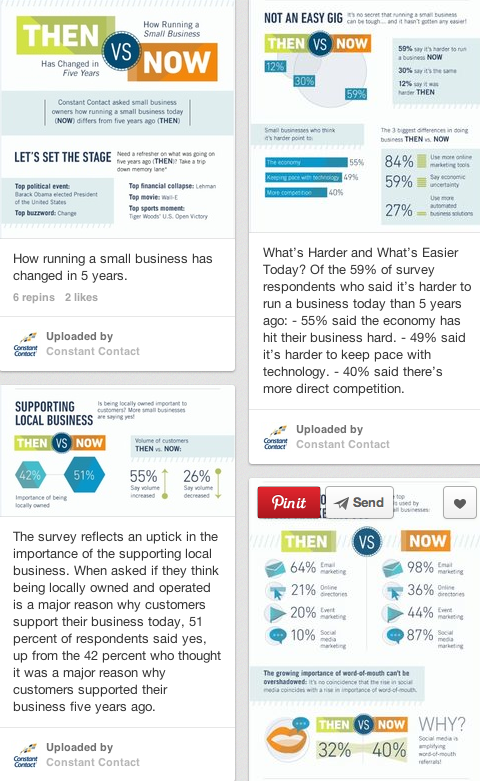 Splitting an infographic into different pins is a way to populate a board. Constant Contact has found that Pinterest boards are indexed quickly and rank high in search results. 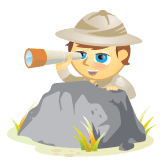 More content per board creates more traffic, which helps in search results. For businesses getting started on Pinterest, Ayotte urges them to focus on quality over quantity. A fundamental principle for social media success is to avoid talking about yourself all the time. The same applies to pinning on Pinterest. “Part of the reason that Pinterest has grown so much for us is because we share generously and are a great curator,” said Ayotte. 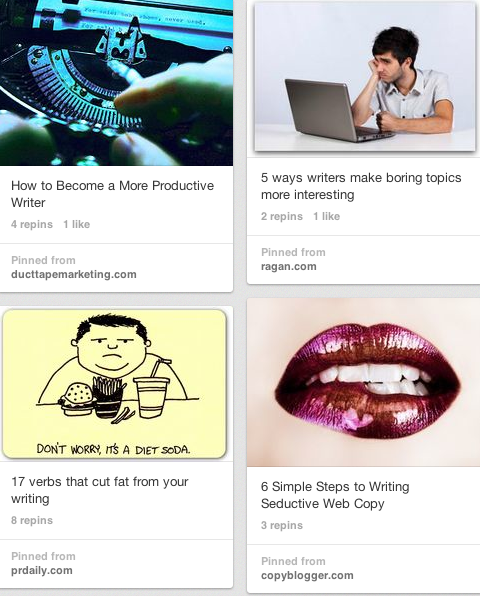 Since Pinterest is used for bookmarking, repinning great evergreen content is a good strategy. It helps populate your own boards, as well as attract followers who trust you will bring them relevant content. Constant Contact repins from a variety of other sources. Constant Contact also has shared regional boards where local offices pin content. Shared regional office boards are a way to bring in more pinnable content. Another strategy is to get your customers involved as guest pinners. 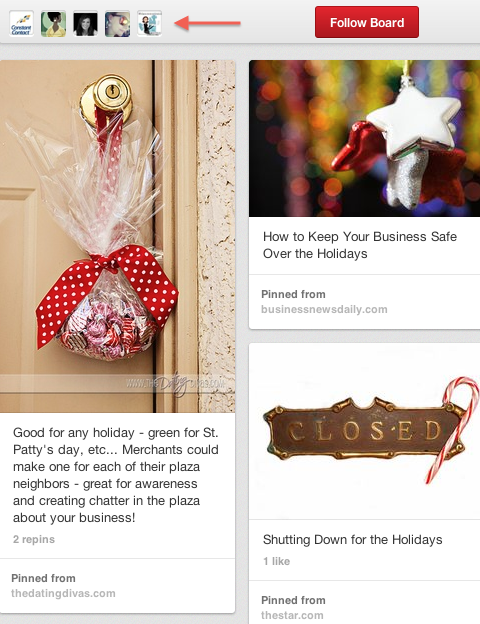 During the holidays, Constant Contact put out a call that they were looking for customers to contribute holiday tips pins and included them as guest pinners on a shared board. Involving your customers helps you fill out your boards and shows you care about what is important to them. Constant contact solicited customers as guest pinners to a shared board. VentureBeat reported that Pinterest drives more revenue per click than Facebook or Twitter. Ayotte said people come to Pinterest with a shopping mindset, using it as a pre-shopping cart. 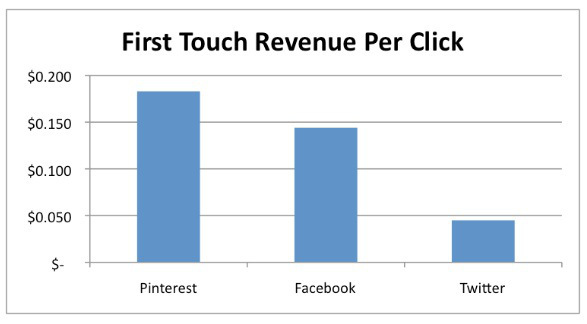 VentureBeat reports Pinterest creates more revenue per click than Facebook and Twitter. Ayotte believes people are more likely to engage with brands on Pinterest, which is why B2B companies should consider using the platform for branding and education. Pinterest is currently one of the top five referral sources for their website. 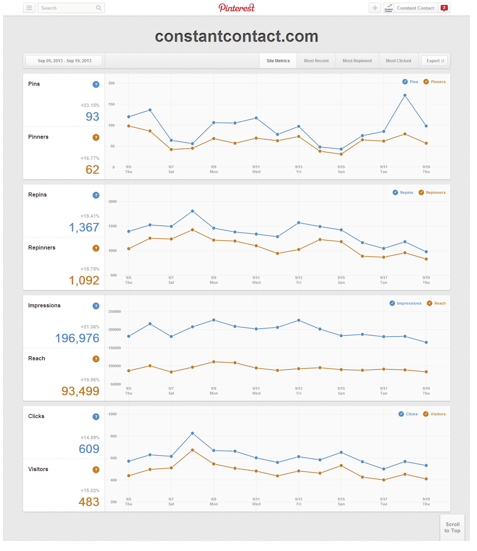 Constant Contact's Pinterest metrics from a two-week period in September 2013. What do you think? 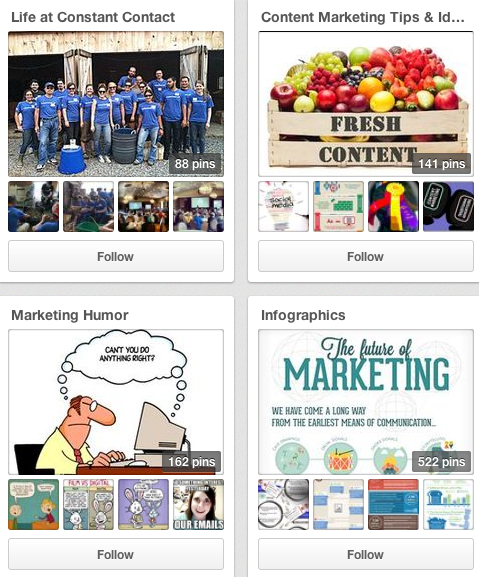 Can you think of ways your B2B brand can connect with customers on Pinterest? Include your comments and questions below.